As we learned in our latest episode of Eggheads, fried chicken has a rich history all over the world. But we’ve always had a soft spot for those that turn crispy, salty chicken into breakfast items. Traditionally that means chicken and waffles. Though some form of the dish has been around since the 17th century, the version we know and love became popular in Harlem after hours at Wells Supper Club in the 1930s before inspiring restaurants dedicated to the dish like Roscoe’s to Gladys Knight’s (yes, that Gladys Knight). Now, don’t get us wrong, waffling has proven a shockingly effective technique for other foods in the past. But why should the joy of fried-chicken-plus-breakfast-food be limited to those with a waffle iron? We wanted a variation on the theme and we didn’t need to go more than six blocks down the street from where Wells once stood. 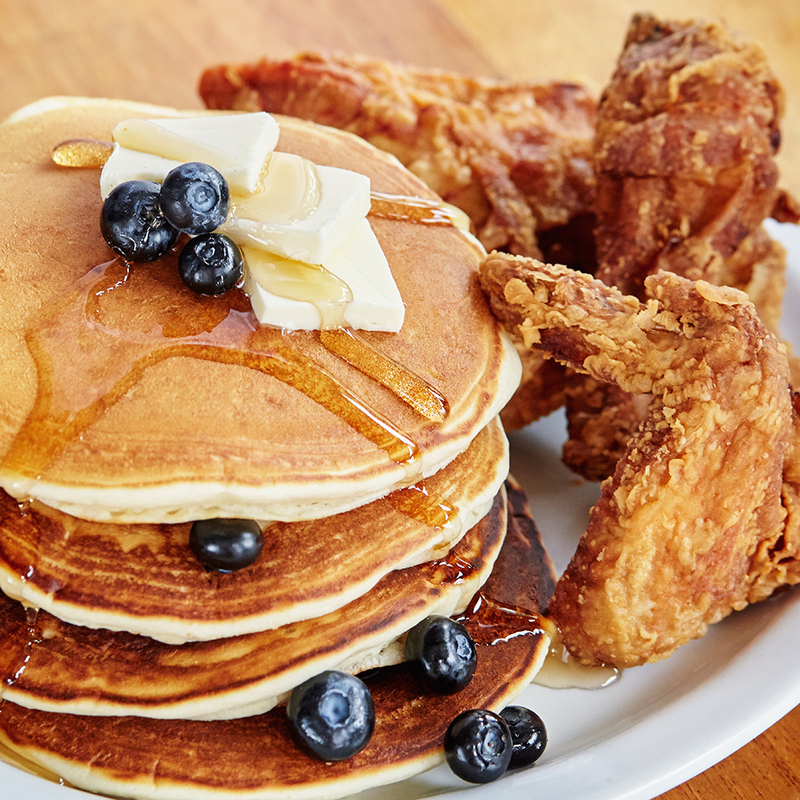 Corner Social, chef Banks White pairs his brined buttermilk fried chicken with pancakes topped with blueberry butter—an ideal way to get some extra mileage out of those summer blueberries. For the waffle apologists, the batter would probably work on a waffle iron too, but we’re going to be flipping pancakes at our next brunch. Bring water, kosher salt, and brown sugar to a boil in a large pot, cooking until the salt and sugar are completely dissolved. Remove from the heat, and let cool to room temperature. Add the bay leaf, garlic, peppercorns, onion powder, garlic powder, paprika, buttermilk, and chicken. Place in the refrigerator, letting the chicken brine for 24 hours. In a large pot, add 12 cups vegetable oil, and bring to 320 degrees over low heat. Combine flour with onion powder, garlic powder, and paprika, sifting until incorporated. Set aside. Remove chicken from the brine, and pat dry. Coat dried chicken with 1⁄4 cup vegetable oil, then dredge in the reserved flour mixture, coating evenly and shaking off any excess flour. Fry chicken, in batches, until lightly browned and crisp, about 15 minutes. Mix all ingredients together until well combined. Griddle until golden brown on each side and cooked through. Let the butter soften to a room temperature, then gently fold blueberries and maple syrup.